We've got some fun Valentine inspiration for you today…..projects you can make with your kiddos, that we think you're going to love! Whether you like to keep your Valentines super simple or you'd enjoy making something a bit more interactive, we've got you covered! Check out these fun new products and the projects we've made with them! If you loved playing with paper dolls as a child, here’s your chance to enjoy them all over again in your paper crafting! The Dress Up Dolls: Puppy Love set coordinates with the Dress Up Dolls: Basics set and contains lots of fun accessories to get your Dress Up Dolls ready for Valentine’s day. This set includes a cute puppy on a leash with an optional sweater, some basic girl and boy outfits, as well as some sweet Valentine treats – chocolates and flowers! 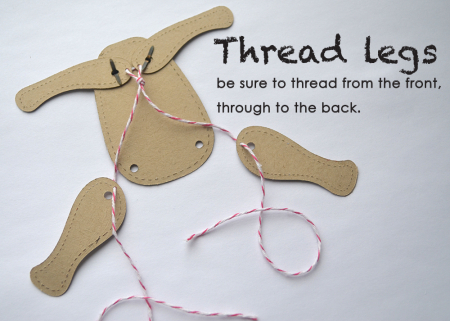 You can use the Dress Up Dolls: Basics and the Puppy Love sets along with their coordinating dies to create your very own set of paper dolls, but of course they’re perfectly at home on cards, tags, party invitations, and wraps, too. Mix and match the accessories across the entire Dress Up Dolls line for endless fun! 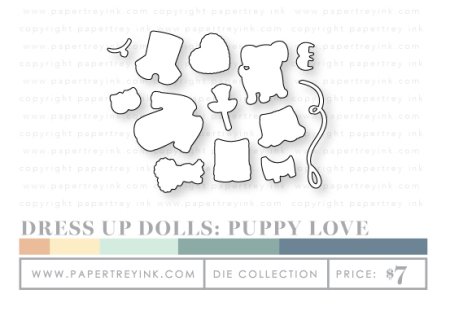 Dress Up Dolls: Puppy Love will be available for purchase on December 15th. Dress Up Dolls: Puppy Love contains a total of 15 images. The assembled dolls wearing head-to-toe outfits measure 2” wide and 3-1/2” high. The puppy measures 3/4” wide and 1” high. The heart-shaped chocolate box measures 5/8”. The bouquet of daisies measures 1/2” wide and 3/4” high. The “be mine” sentiment measures 1-3/8” wide and 1/2” high. The “hugs & kisses” sentiment measures 1” wide and 3/4” high. A coordinating die collection will be available for sale separately, retailing for $7. This collection includes a total of 13 dies. Leash: 1 7/8" x 7/16", T-Shirt: 7/8" x 7/8", Polo Shirt: 1 3/16" x 1 1/4", Skirt: 5/8" x 7/8", Shorts: 3/4" x 5/8", Puppy: 1" x 7/8", Flower Bouquet: 7/8" x 5/8", Rose: 13/16" x 1/2", Puppy Sweater: 1/2" x 9/16", Heart: 11/16" x 3/4", Collar: 1/4" x 7/16", Girls' Shoes: 5/16" x 1/2", Boys' Shoes: 3/8" x 9/16". Use these images in combination with the coordinating Jumping For Joy die collection (sold separately) to create a new and modern version of classic jumping jacks. With bold classic shapes to add definition to the facial features, these are versatile and will never go out of style! Perfect for extra special valentines, and even birthdays! Jumping For Joy will be available for purchase on December 15th. Jumping For Joy contains a total of 29 images. The pig snout measures 5/8". The whiskers measure 1-3/8" x 3/8". The bear nose measures 1/2" x 3/8". The circular sentiments each measure 3/8". 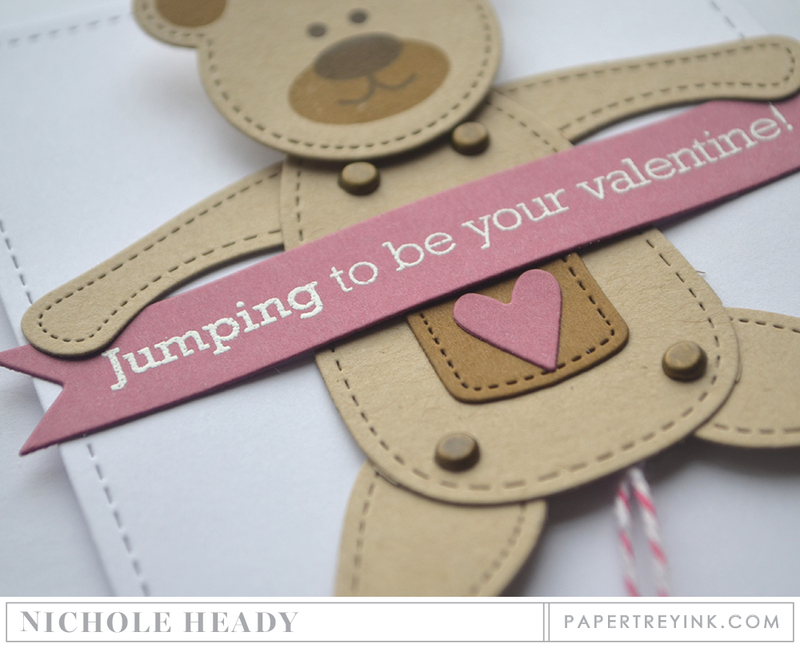 The "Jumping to be your valentine" sentiment measures 3-3/4" x 1/4". A coordinating die collection will be available for sale separately, retailing for $27. This collection includes a total of 14 dies. Bunny: 2 1/2" x 2 3/8", Cat: 1 1/2" x 1 3/4", Bear: 1 1/2" x 1 7/8", Lion's Mane: 2 1/2" x 2 3/8", Body: 2 9/16" x 1 11/16", Front Legs: 1 15/16" x 5/8", Back Legs: 1 15/16" x 7/8", Tag: 3/4" x 5/8", Heart: 5/8" x 1/2", Star: 9/16" x 9/16", Small Patch: 1/2" x 9/16", Large Patch: 3/4" x 7/8". This coordinating card die provides you a card base with a slit that you can slide the jumping jack into for presentation/giving. The sentiments in the set fit on the included banner! 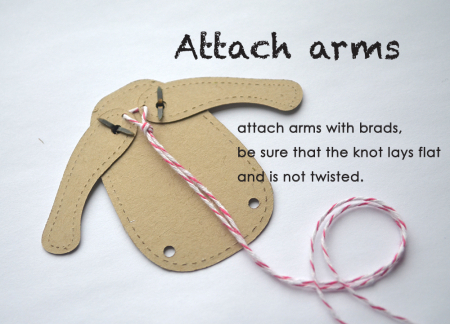 Not to mention this is a great basic to have on hand for other things as well! 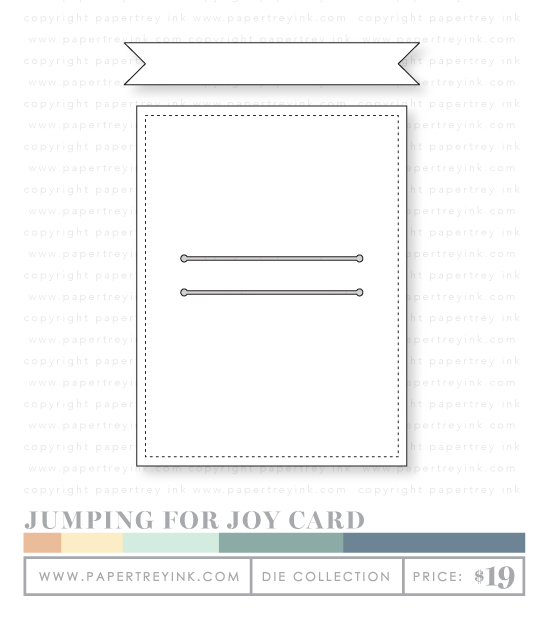 Jumping For Joy Card die collection will be available for purchase on December 15th. It will retail for $19. Jumping For Joy Card die collection contains a total of 2 dies. Banner: 5/8" x 4 1/8", Card: 5" x 3 3/4". I am thrilled to share a bit more about the Jumping For Joy collection with you today! It is really an amazing collection of products that can be fun for children to receive or make themselves! 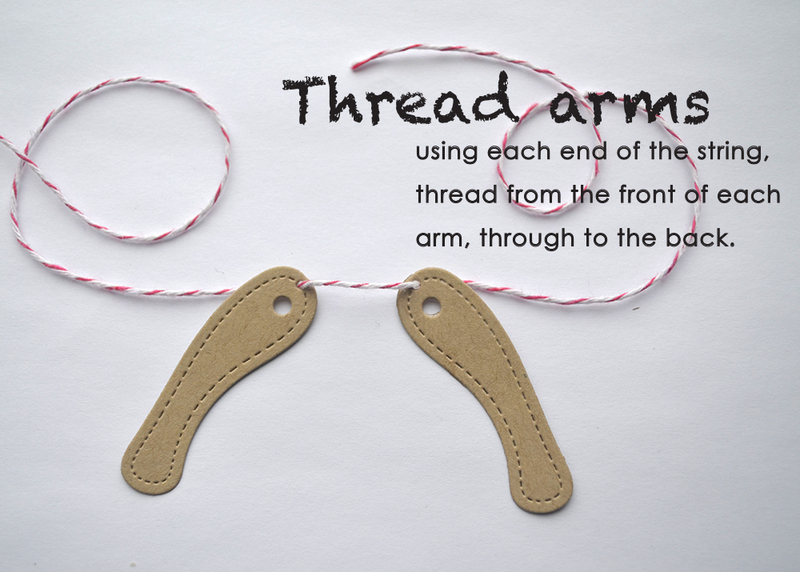 I created a visual step by step guide for assembly, showing just how easy these are to create! Our products do the hard work for you! I've thought of every detail for you, even packaging the jumping jacks up for giving! The jumping jacks easily slip behind the slit in the new Jumping For Joy Card die. The coordinating banner die that comes with the card die layers perfectly over the center strip, giving you a great place to tuck the sentiments that are included in the Jumping For Joy stamp set. 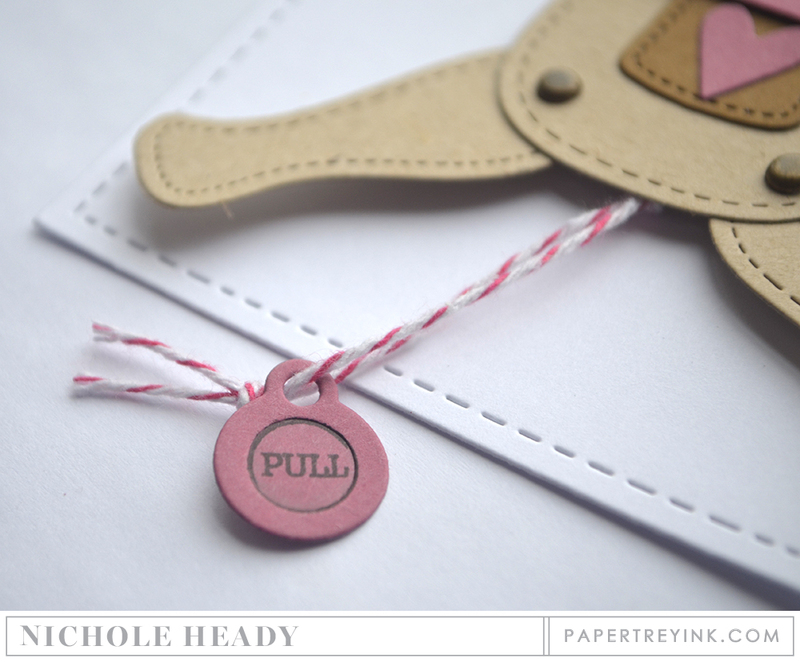 There is even a little tag die-cut with coordinating words and phrases that tuck into the embossed area. 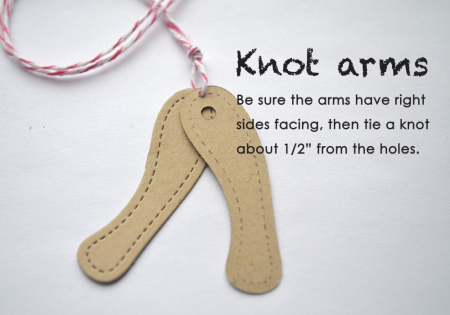 These are great for adding to the end of the pull string of the jumping jacks, tied around their necks, attached to their ears, or even accenting their pockets! 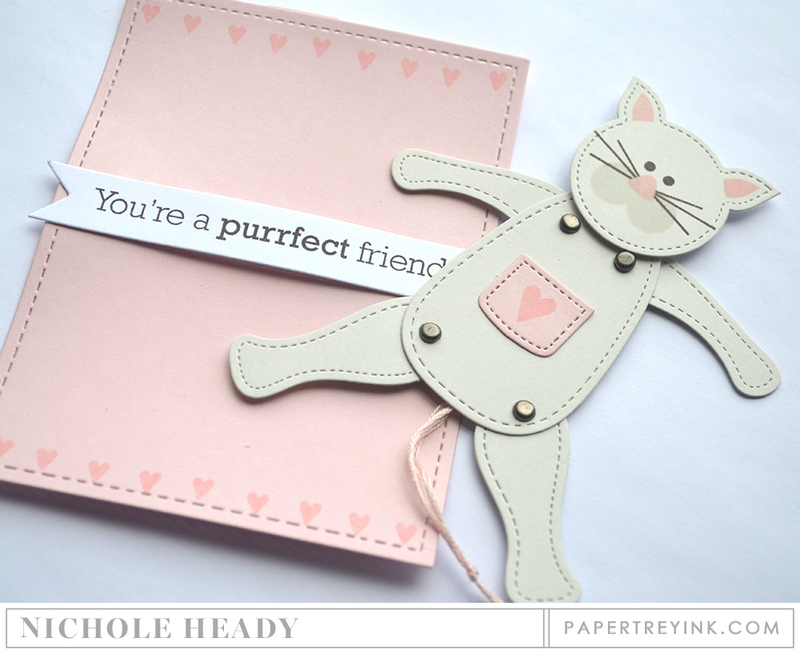 There are lots of variations you can create with the basic dies and simple stamps, here I have put together a cat. Don't you just love that little sweet pocket! You could tuck a tiny note or something into it if you wished! Next up I have another way you can use these animal elements. By folding the body in half, you can create a standing animal. There are great little playthings for children and look great when attached to the top of a gift! I adhered the legs under the body with scor-tape for extra durability. The face is tamped, then I added some accents with white pen. Did you notice that this is the same head shape as what was used on the bear? By just adding the mane and alternating a few bits and pieces, you get a whole new animal! The dog leash die from Dress Up Dolls: Puppy love is actually the perfect tail for a critter standing up! I hand-cut a few little bits of Canyon Clay cardstock to add to the end of the tail. I can visualize a whole menagerie of these lined up in a playroom! I might have to experiment with making them out of layers of felt and paper too! 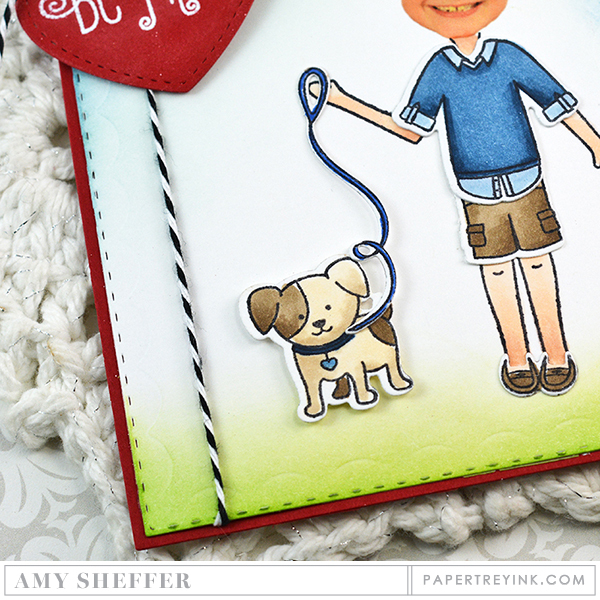 Amy says, "If you enjoy crafting handmade Valentines, you're going to love today's kid-friendly products. Nichole's Jumping For Joy is a delight for all ages, and a great way to get the younger ones involved in the crafting. Betsy's Puppy Love is darling. Just wait until you see who's at the other end of this sweet puppy's leash!" Ashley says, "Papertrey Ink has done it again! This time, you and your child will shine during the Valentine's Day holiday season with fun and interactive treats to share. Jumping For Joy is such a great idea for parents and children to create Valentine projects together. They can also be used on other projects without the use of the interactive feature. And of course Dress Up Dolls: Puppy Love is the cutest addition to this collection. Add a sweet treat and you will surely bring a smile to someone's face. I hope you get a chance to take a peek at my Valentine's Day crafts today!" 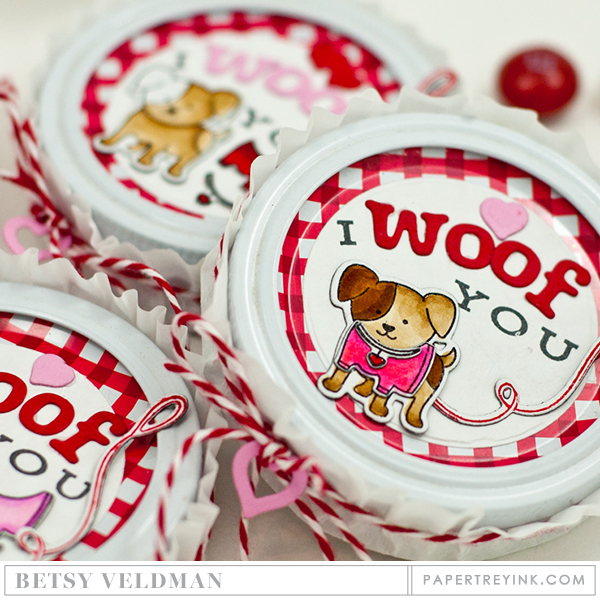 Betsy says, "What a fun bunch of Valentine products today…interactive items are always a hit around here! I hope you'll stop by to check out the magnetic dress-up puppy treat containers I created using some basic items…mason jar lids and cupcake papers! 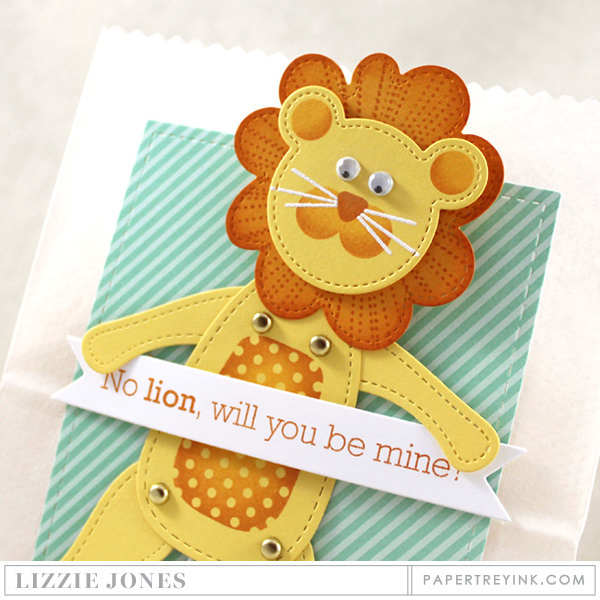 Plus I have a project using the adorable new Jumping for Joy stamps and dies!" Dawn says, "When I was little, I loved picking out that box of Valentines at the store and writing on each one, for all of my classmates. But I would have really loved being able to make my own with stamps and ink and some card stock! I have two different Valentines to show you, both of which can easily be made with your kiddos, allowing them to customize them any way they want! 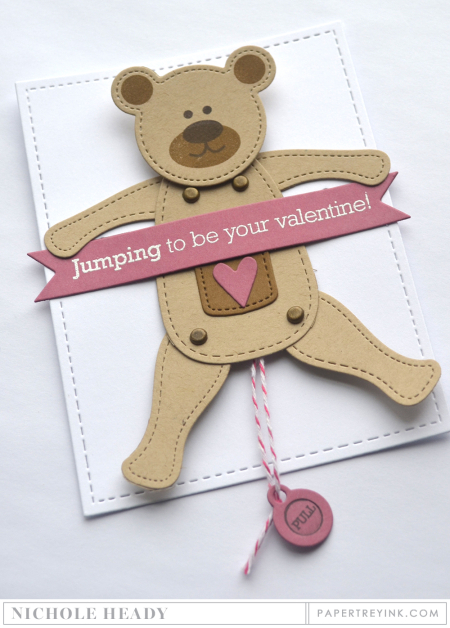 Pop over to my blog to see…give Valentines this year, that aren't like anyone else's!" Heather says, "One of my favorite things about Valentine's day has been sitting down to create Valentines with my girls. There are some great new products this month that are perfect for crafting up some sweet Valentines for this and between all of the inspiration from the design team, you will find the perfect project to create!" Kay says, "I have such wonderful memories of making Valentines cards and projects for my friends and family when I was a kid, and I love keeping that tradition alive with my kids too. I have a couple of projects on my blog created with Betsy’s newest Dress Up Dolls, and Nichole’s adorable Jumping For Joy Set that would be perfect to create along with the little ones or for the little ones!" Laurie Schmidlin says, "Valentine's Day has always been a favorite holiday of mine. I just love that there is a whole day dedicated to letting others know that they are special and cared about! Creating heartfelt gifts and cards for my kids and their classmates is something that I look forward to every year! The new products being showcased today are not only perfect for creating cute and clever Valentine's Day gifts but are versatile enough to be used year round!" CLICK HERE to see more from Laurie Schmidlin. 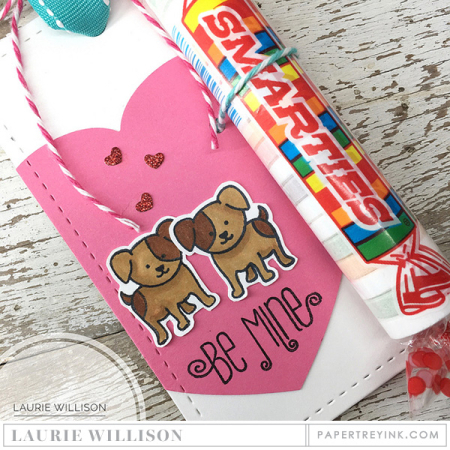 Laurie Willison says, "One thing I have enjoyed every year, is making valentines with my kids. They always love stamping and cutting and pasting. The new Dress Up Dolls: Puppy Love is a great new set to help create adorable, handmade Valentines with lots of possibilities. 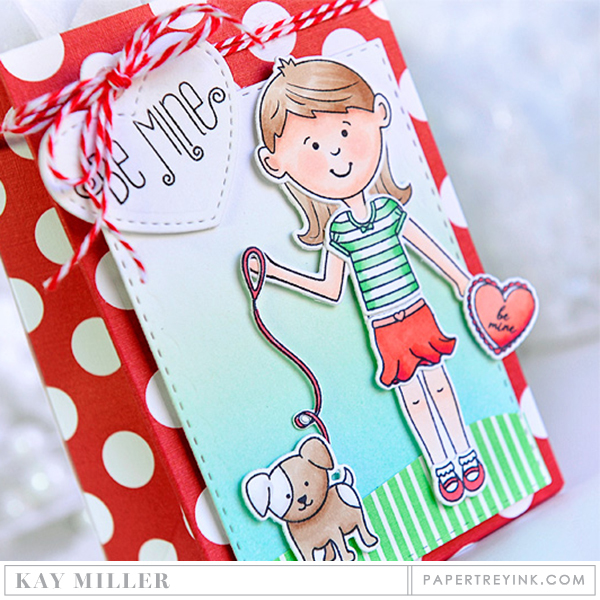 I did a little mirror image stamping today, and created a fun, kid friendly treat!" Lizzie says, "Coming up with cute, clever, and unique Valentines can be a challenge year after year. We're sharing some fantastic new products that will make it so much easier! Not only are these new stamps and dies adorable, but they're also so simple to use you can make your kids can lend a hand. Stop by to get a closer look!" Melissa says, "Jumping for Joy is going to rock your Valentine-making world! It's simply sweet, creative, unique, interactive, easy, and kid friendly! I love the mix of animals and "punny" sentiments just waiting to be used." I hope you have enjoyed all these amazing creations that both the team and I have shared with you today! What do you think? Are you more the simple Valentine type? Or can you see yourself making these fun jumping jack toys with your kiddos? We would love to hear your initial thoughts on everything we introduced! Please leave a comment on this post to tell us what you think of the new products and you will be eligible to win big! You have until 7am ET, December 15th to leave your comment and be eligible to win. Only one comment per person please. One randomly selected winner will be announced on our December Release Winners Page before noon ET the same day. Thank you for stopping by today and best of luck with the contest! FINISHED SIZE: 5" x 3-3/4"
Everything today is cute, cute, cute! Bunnies and Lions! Oh Boy! What cute new products and terrific samples. So many cute Valentine ideas! What a cute idea. Love that you can make all kinds of animals from one set. Such a cute idea!! I love it!! A perfect Valentine to make for the little ones in your life! The movable animals are so fun! These look like they would be so much fun to receive. Goodness gracious….these little animals have the WOW cuteness factor for sure! I love the valentine theme. I’m so glad my grandkids are young enough to enjoy giving valentines at school. Such a cute gift idea for kids! LOVE The Jumping For JOY! So FUN!!! Oh, these are adorable! If my kids were younger, I’d be all over them! Love the jumping for joy set, it will be perfect for my grandkids! Can’t wait! ? Love that Jumping for Joy set! Fresh Bouquet is the one I am most excited for. I love the little jumping jack toys – they are so clever and I love that you can making them standing as well. The Jumping for Joy set is so cute! Can’t wait to use this with felt! Very, very sweet! I especially loved Melissa’s bunny card! The PTI designers never run out of creativity; I’m always impressed. I love, love, love the Jumping for Joy stamps and dies. That’s why I buy from PTI the creativity is just fantastic. These are a must have. I love how the animals can also be made to stand! How very cute they all are! Jumping for Joy is awesome! So great for kids! I love it! The Jumping for Joy collection looks so much fun! What a fun way to make cards with an interactive element. Loving all the different animal options & the punny sentiments. Oh! These are all so cute! Cuuuute little critters! They’re so adorable. The Jumping Jack is so clever!!! Awww…all of these valentine creations/gifts are so cute! The Jumping for Joy set is so cute! And I love the font for the puppy love set sentiments. What great ideas for Valentine’s Day! 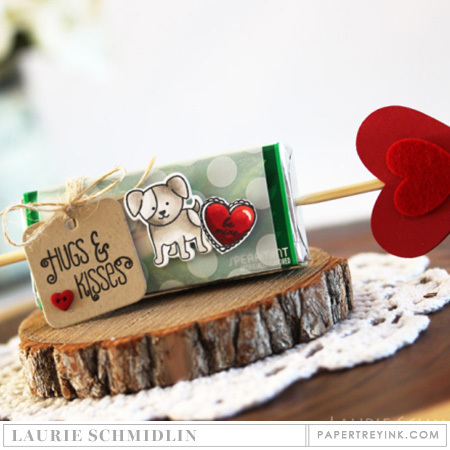 Such sweet Valentine ideas and products! Great month, PTI! Wish I was young enough to still get valentines like that!! Such cute animals – love the lion! I have a “jumping jack” wooden toy from Germany, given to me by my Oma long ago! I’m so excited to see it as a paper craft!!! Cute little interactive critters. So much fun, perfect for Valentine’s Day. “Jumping for Joy” is so cute and absolutely ingenious! Ah, Valentine’s Day. Very cute. Love the moveable little animals. Jumping for Joy is adorable! Especially that lion! Thanks for the Valentine smiles in all the projects today. So much fun! Loving all the new Dress Up Dolls supplies, and the Jumping for Joy supplies are fabulous! Great design team samples. they are adorable! Wish I had some youngsters in my life! This is a super cute animal die cut set. Absolutely adorable! These jumping for joy stamps and dies are so cute they make me smile. So cute to give to children! Such a creative idea! Just love the bunny! Wow! 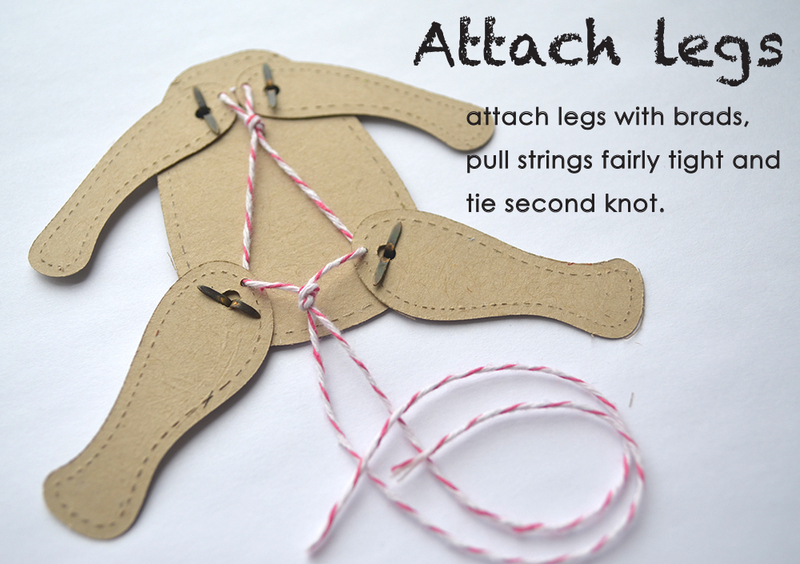 These are so adorable – as much fun for the kids to make as to give! Love these! So cute! Love that teddy bear! So much fun with the Jumping for Joy products! I love them! Oh my Jumping for Joy looks so cute and fun! 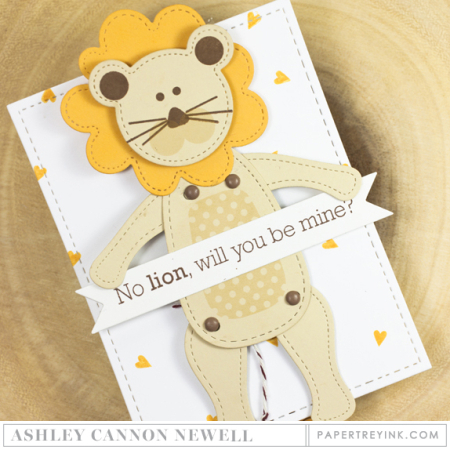 I love all the animal options , funny sentiments and that you can even make them free standing! Love Jumping for Joy! How cute are these little animals! So cute! Thanks for the opportunity!! Such a clever reveal today … love those moveable animals. Amazingly thoughtful and doable! Thank you for inspiring us with the creativity of your products. Merry Christmas and God bless. The cat version looks so cute. Everyone’s projects are just precious, I can’t wait to give them a try!!! Wow – the animals are all so cute!! I especially love the kitty. Jumping for joy is just so amazingly fun & cute! What a great idea! Puppy Love and Jumping for Joy are both really adorable additions to the PTI lineup. Children and grandchildren of stampers will rejoice if they get some of these items! The Jumping for Joy set is UN-BELIEVABLE!!! This is amazing I need this set!!! oh my goodness this is cuteness overload!!! how perfect! The little critters in Jumping for Joy are too cute for words. The sentiments that go with them are so perfect for Valentines. Thanks for coming up with another winner! I love interactive cards and these dies take them to a whole new level. It never stops! So many fun and creative ideas with these fabulous new products. The puppies are very cute! I’m seeing some very unique products lately. And of course, the design team takes it to the next level!! Oh gosh, Jumping for Joy is SO adorable! I love that you can get so many different looks from it! The lion is my favorite. Jumping for joy for the Jumping for Joy stamps set and dies. Pun Intended. 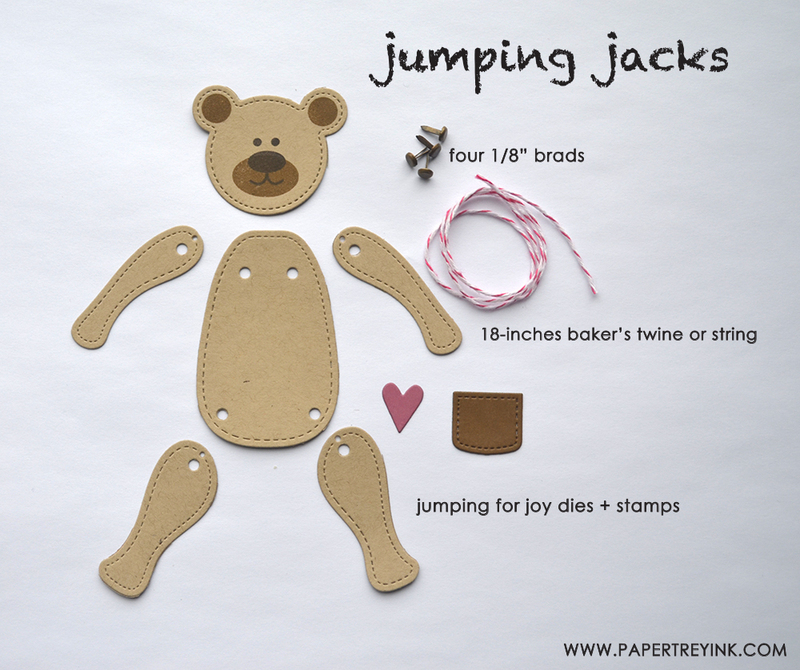 I’ve always wanted to make one of theses “jumping jack” toys and now thanks to PTI I can! What a great idea “jumping for joy” is. The kids will love to get a card with one of the animals on it. The sentiments are adorable. What adorable, kid-friendly products today! Today’s products are very cute. Such adorable projects, love them all. My favorite has to be Betsy’s cute dog containers. Just adorable!!! What cute items for Valentine as well as other holidays! What a great idea! These Jumping for Joy dies are great. PTI is always so innovative! Love that Jumping for Joy set. Soooooo cute! Jumping for joy looks like so much fun! Our grandchildren will adore them! Everything today is very cute!!!!!!! Love that Jumping for Joy. The creativity is so fantastic!!!!! Way to go on a completely unique crafting product! I can’t wait to see these in close-up action! 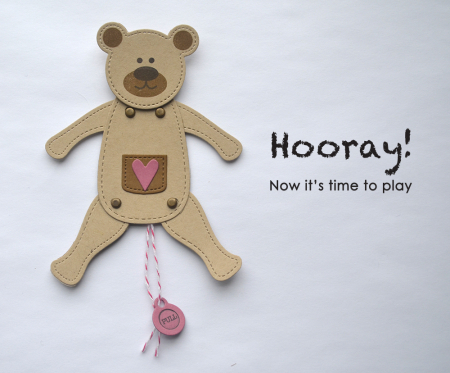 Jumping for Joy…I love interactive cards! Oh my goodness! What will you think of next, PTI?! How creatively cute! What a neat idea and leave it to PTI to make it happen. Everything is so cute today! Such creative cards and projects. Oh my. Maybe Merry Christmas to me?? The Jumping for Joy is so adorable! Kids will go crazy to give and receive them. And I adore Puppy Love. Such a sweet idea!! Love these Valentines! Looks like everyone had fun creating with these new sets. Such creativity, how do you gals do it? The Valentine ideas are so cute and how much fun will that be for little kiddo’s to help make them. The jumping animals are fabulous and unique! I’ve not seen dies like that before – the jumping jacks dies are going to be a hit with the kids. I love everything about this release. Oh my! That’s so adorable! Love the variety of animals you can make too! These are so cute and will be so much fun for kids to do. Oh my, so much cuteness in one release! Just cannot get enough of the dress up dolls. Love the addition of the little dog to the set. The jumping jacks are such fun. The lion is so cute! Jumping for Joy looks like so much fun! Dress Up Dolls: Puppy Love stamp set is so cute. Thanks to all for sharing their creations. The new products are so cute!!! My 3 year old grandson would love these! Thanks for the detailed instructions. Neat! And Cool! Are two words I would use to discribe the latest products showcased today. These are so cute! Thanks for the generous giveaway! I’m jumping for joy as these will be mine soon. Jumping For Joy is just fabulous!!! I love all the different animals included. So creative! What adorable Valentine ideas today – so wish my girls were small again!! The Jumping for Joy animals are so novel – I can see kids loving those cards! These are great ideas for kids! Jump For Joy is too cute for words!!! This is such an awesome release and the design teams creations are so amazing! Love PTI! Jumping for Joy will be so fun to use for creating fun interactive cards. Those jumping for joy dies are brilliant! So creative! The Jumpimg for Joy dies and stamps are adorable! Lots of fun Valentine ideas! Jumping For Joy is just delightful! Fabulous products! Amazing projects! Wow! Wow, today’s collection is super cute! How clever you all are! Love the idea of the Jumping for Joy interactive card, but, PLEASE, couldn’t you have arranged it so that the pull mechanism works from the TOP and NOT the bottom??? Adorable!!! What a great day!! The Jumping For Joy dies are a lot of fun! I love the new Dress Up Dolls set too. Jumping for Joy is adorable. Can’t wait to make some for my grandkids. The versatile jumping jack is darling. What fun it will be to create with. Great samples by the DT. What else to say except, I *woof* this new release! Jumping for Joy!! Just when you think the designers couldn’t possibly come up with anything else … they do! Every month I’m just amazed and fall in love. These are such fun Valentine projects. The interactive jumping jacks animals are great. They would be so appealing to kids. These articulated critters are adorable ??? So, so cute!! Can’t wait for my grandson to see these!!!! Oh my! Jumping For Joy is the cutest thing around! I’ll be getting a set to craft with my grandgirls! I enjoyed the moving pieces. I think kids would love them. I LOVE, LOVE, LOVE this idea! So many great options and very punny. Just love the animal pull toys. Oh how cute! 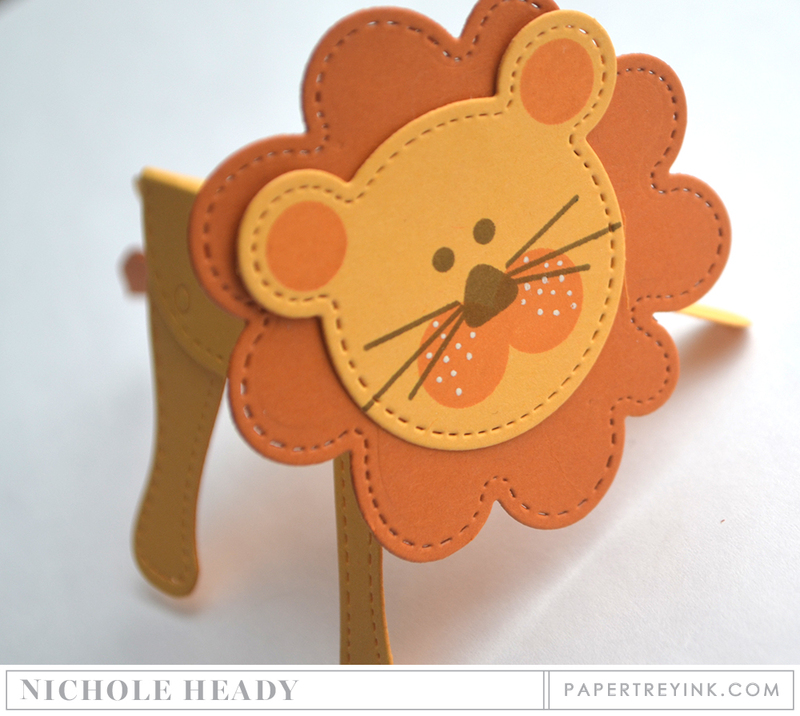 I love how you made that little standing lion, too! Oh my goodness! I am loving all these products!! How so adorable they all are! I especially love all the creations the DT made using them! Today’s post are so adorable! OMG you got me Jumping for Joy!!! Oh how cute! Every month you guys never fail to inspire and excite our creative juices. Thank you! This release is so cute. Love the valentine themed products. Thanks for sharing. So, so fun! If my kids were younger we would for sure make these darling valentines. This release just keeps getting cuter and cuter. I need the dress up dolls puppy love. Jumping For Joy is so darn cute! Jumping for Joy is so adorable! Love all the different animals and sayings! This will be perfect for my grandson for so many occasions! A must have on the 15th! The Jumping For Joy collection is fabulous! I can see a lot of interactive cards and stationary playthings made with this set. Imagination, project supplies and little hands only limit you to creating the cutest animal elements. The jumping animals are cuteness galore. There already a lot of ideas for using these in my mind. Love item. Such a cute idea. A little too much work for me, but so cute. Adorable! Not only are they cute, but they do look easy to assemble thanks to the detailed photos on the blog! I think Jumping for Joy just jumped to the top of my list! The jumping jack animals are so cute! Can’t wait to see more of them. Cute so cute! All sets are so cute! Wow! I LOVE the Jumping For Joy set!! Adorable! I love all the new projects! That bear is too cute! Love this idea. Such creativity from you guys, each and every month. Oh how cute is the jump for joy sets! Anyone would be jumping for joy to receive them! What a fun set of dies! 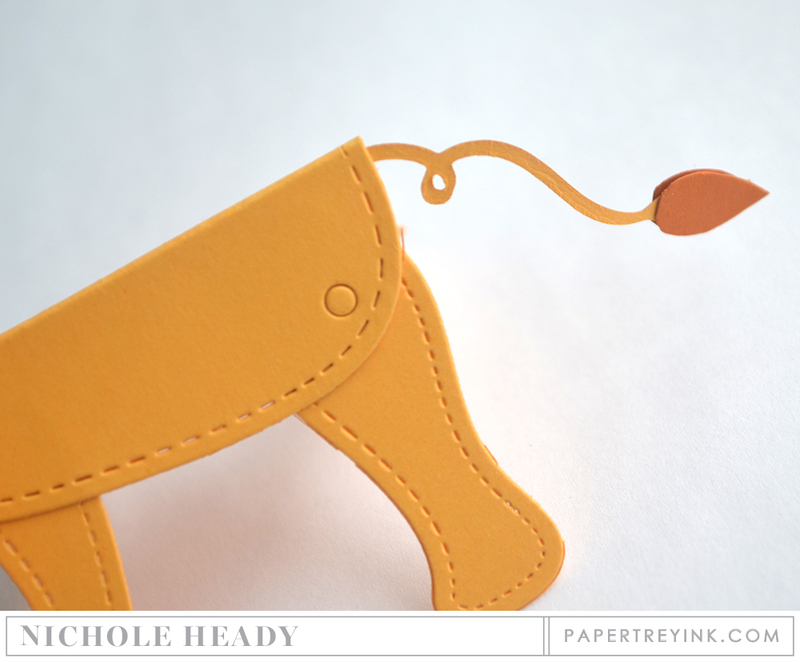 Leave it to Papertrey to come up with something so innovative! OMG!!!! Joy stamps and die are absolutely awesome!!!! Nichole I love so much your creations!!! One of the most original and breathless release!!! What fun projects! I love Valentines Day! Jumping for Joy is so cute! Jumping for joy at all the cute inspiration! So cute! So fun! Who wouldn’t love to get cards like these?! The jumping for joy dies are so adorable! I love the Puppy Love valentine set. I’m ready to make some “heart” cards! Oh my goodness! The little jumping animals are adorable! So creative! Jump for Joy set is very cute and would be fun to do with the grandkids! These are really cute products and I love the many ideas as to how to use them. Thanks for the inspiration! Oh my! These new products are so clever and totally cute! The jumping for joy critters are so cute! I love that they move and are like a toy that kids can play with. The Jumping Joy products are so clever. And the puppy dog set is so cute! You guys always lead the way on interactive and unusual items! The Jumping Jack set will join the ranks of Petite Places, your Shakers and Sprinkles and Erin’s stitching dies as products everyone else will be copying soon! Talk about cute!! Totally awesome! Love love love these animal dies. So versatile! These are so adorable! i wish my boys were little again to enjoy these. how fun and creative. How do you think this stuff up. These sets are on my list. Those animals are the cutest things I’ve ever seen. How wonderful! The Dress Up Dolls accessories are adorable. those are so sweet! I think the last time I made one of these was with flimsy construction paper in about grade 3? This sounds much, much nicer! I’m in love… everything today is adorable, and definitely in my cart! Interesting concept! Dosen’t really fit my style or interest but they are cute! Those animal faces are too cute! will make great baby cards as well. The Jump for Joy set is adorable and doesn’t look that hard to put together. Thanks for the step by step pictures. I like the stand up lion as well. So Cute! I love these so much!!! How perfect for the little ones in my life, especially. Jumping for joy is absolutely adorable! So cute for those who do children’s cards! Just finished looking at all the darling projects! Love that little tissue box and all the get well products! Merry Christmas to you all at Papertrey Ink ! I love the ingenuity of the jumping for joy dies. So fun!! I can’t wait to get Maile’s swam stamp set. Oh my goodness, the jumping for joy set is adorable!! Really cute jumping jacks…love the interactive feature. I love all the cutie animals! How fun for kids too. Very creative stuff! What a wonderful idea. So unique! I like how you transformed the flat lion into a standup. My grandson’s would love these! So cute! Such cute and clever products and projects today! This is such a unique set and it brings back memories of a favorite toy. 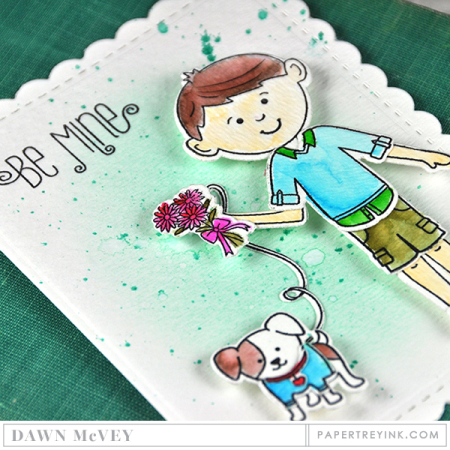 Jumping for Joy stamps and dies are completely adorable! Really a great idea! So many cute ideas – just love the Dress Up dolls! Very cute interactive creatures! I can see multiple uses for the dies and stamps. Jumping for Joy is just adorable and I love that they can be stand up figures too! My grandsons would love these. I a,pm more than excited about the new Dress Up Dolls this month. They are so cute. I love the fact I can make cards for boys with this set. These are just too darn cute….love all the sweet critters. I love the Jumping for Joy set. What cute Valentine’s they make! Such an adorable toy for kids of all ages (even us adults!) – and I love all the puppies! Love the jumping for joy set. Your products are THE best. Your design team is amazing! Love the interactive elements created with the jumping for joy dies. What great inspiration. Love all the projects and products. These jumping for joy stamps are just way too cute. Loving these new releases. Great creative inspiration. A fun treat to come home to this post! Oh, I love Jumping for Joy. 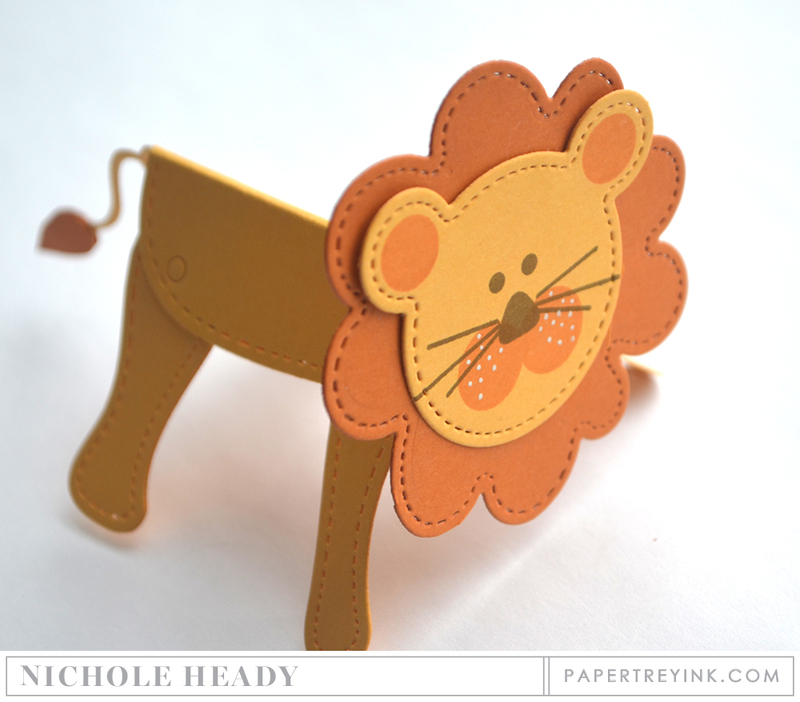 Such a neat die set… love the different animals you can make. SWEET! Oh these are so cute! There is such a great choice of animals. It’s nice that they can be used as stand up figures as well as on the cards! PTI and valentines I love it . The jumping for joy is the sweetest! The Jumping for Joy set looks fantastic. Such fun! All of the projects are just adorable!! I love the lion & pig jumping jack. I must admit. . . even when I see a set I don’t think I like, your designers come along with their fabulous projects and make me want everything!!! This is such a creative product!! How fun! What a cool concept! As usual, the design team has designed such adorable projects. Love all the projects from the group post! Great new stamp sets and dies-so creative! Jumping for joy is the cutest set ever, I love all the animals and sayings that you can make with this. Jumping for Joy is amazing! I can barely wait to try it- its going to make fantastic cards!! The lions are so cute! So cute! Love that lion! I am jumping for joy with these new products. The new Jumping Jack set is so adorable. It’s perfect for little kid & baby cards. Such cute projects! I am more of a simple card girl, but I love the amazing projects of all types. What fun these interchangeable cute animals will be. They will have everyone jumping for joy. I love seeing these cute, interactive projects! I’m probably a more traditional type of Valentine giver. If I had younger kiddos it’d probably be different, but mine are already teenagers. Very cute idea though. The jumping jack card/toys are adorable. I can see myself making them with kids that I sometimes babysit. They love to do crafts. Such fun! 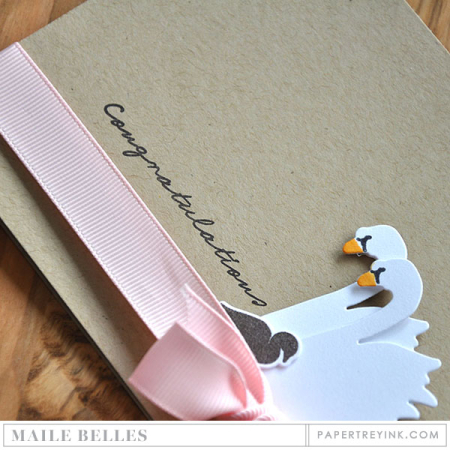 Today’s shareings make me smile all over and swans to announce a new baby–unique. The Jumping for Joy stamps and dies are absolutely adorable. My nephews would love playing with them. Oh these jumping characters are so fun! Very, very cute projects showcasing the new products. Nichole, your Jumping for Joy critters leave out absolutely nothing. You made it so easy for kiddos to help create…love that idea! Great inspiration today. The Jumping for Joy animals are adorable. I love everything from this new release! Every month I am so blown away by the talent of the PTI design team!!! 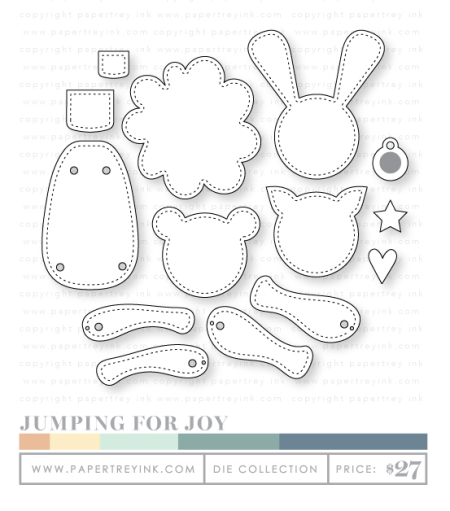 I absolutely can’t wait for the Jumping for Joy dies, they are going to be so much fun to create with!! So stinkin’ cute. Love the variety of animals. There are so many things to look at and love this month! Thanks for the chance to win a gift certificate – it would be well used! Jumping for joy is so stinkin cute!! The Jumping for Joy stamp and dies are very clever! Wish my kiddos were younger! What fun interactive cards! Love it! Those animals are so cute! Jumping for Joy has a lot of cute stamps and dies as well. Can’t wait! Such a fun idea:) I love the jumping for joy stamps! the new jumping jack stamps and dies are so cute!! What fun! I remember playing with these type of pull toys at my grandparents! Oh my goodness!!! I am soooo jumping for joy right now!!! Fabulous!!! The puppy is too cute! Your Jumping Critters! are abut the sweetest thing I’ve ever seen!! Jumping for joy is super super cute! And Fun! Jumping for Joy is so cute. What a great idea! I love these Jumping for Joy stamps and dies. 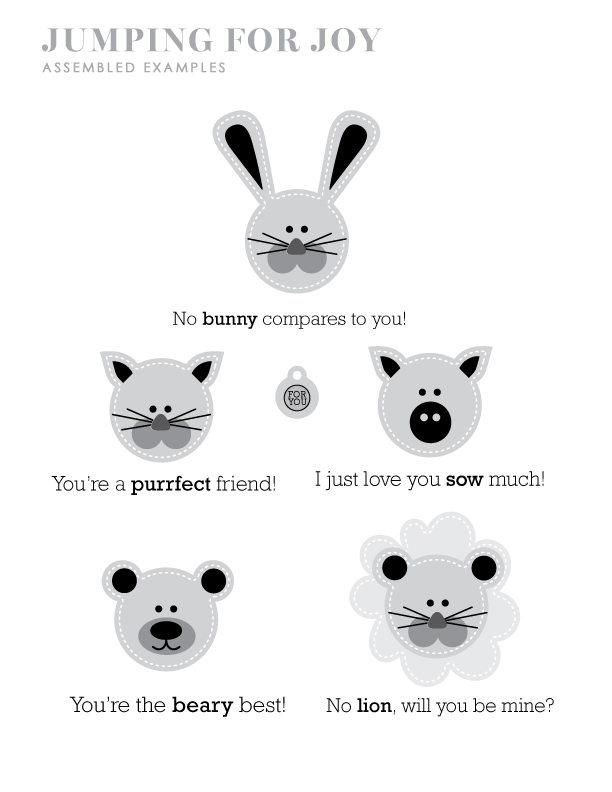 These are so adorable and can be used on baby packages, valentine cards, etc. I am jumping for joy with the incredible cuteness of the jumping for joy set!! Jumping for Joy is brilliant! Such a unique and cute concept! 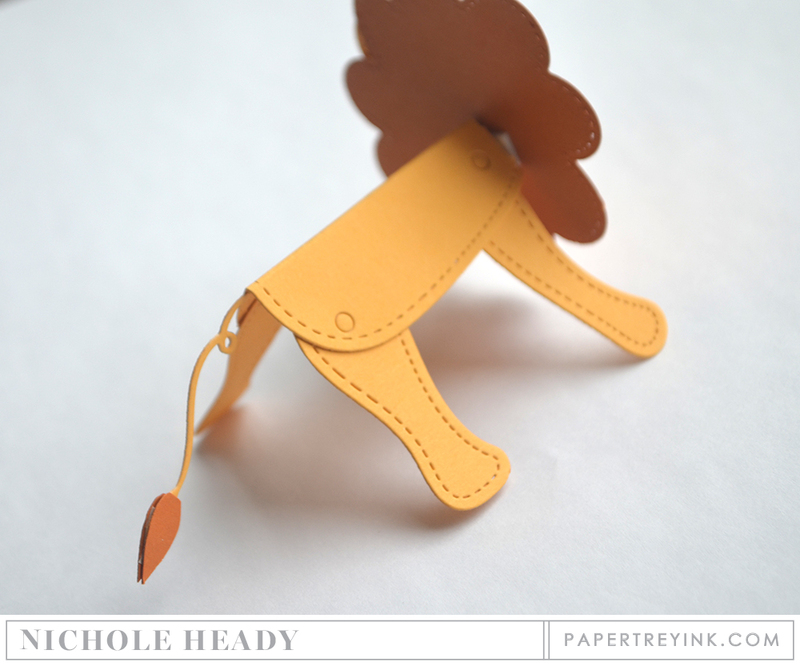 The jumping jack animals are precious….i love how they can be formed into ‘stand up’ animals! OMG I am so excited about this new release!!!!!! I LOVE the new Jumping for Joy set and can’t wait to order it!!!! WOW this new release is amazing!!! LOVE LOVE LOVE all these wonderful new products!!! I love the new release along with the interactive projects. They make wonderful gifts! Super cute sets for Valentine’s Day and kids celebrations! Jumping for Joy is a darling set. If I had little ones, I’d be sure to buy it. So cute and so clever. So cute! My kids are a little older, I see myself using them for baby cards. I love it all, it’s going to be hard to choose! Super cute projects by all! Love the jumping for joy dies. This is a must have. Very clever and fun these dies are. Love them. Kid friendly for any age child. Oh God!! This Jumping for joy is so cool !! Those quirky sentiments are quite interesting and fresh. And those coordinating dies will be fun!! Those animals are really cute! You are all so creative! Really cute ideas today. I can see using the “Jumping for Joy” animals for baby shower invites or newborn baby cards. Adorable! Love the lion! Thanks for the chance to win! This has been another great release. The Jumping for Joy products are positively adorable!!! And I love Betsy’s new Puppy Love set!!! I adore the jumping for joy set – just an amazing new concept. Leave it to PTI to come up with it! You guys are awesome! Clever, adorable little critters- Love it! Absolutely LOVE the jumping animals – super fun design – and great card to hold them – also love that they can stand up as well! Love the new stamps and dies! It is wonderful. So cute and fun for the littles! Oh, my goodness! I love the jumping for joy. I can’t wait to start playing with it. Wow, I’m impressed! So cute. Jumping for Joy – super cute for kids ! Those little animal faces are simply adorable!! I am so torn about all of the great things created this month!!! I can’t decide what to order for this month. The swans are a YES!!! Flowers check! Oh my!! How clever are the jumping jacks!?? LOVE Them! Jumping for Joy is so adorable!! What a great month!! I LOve what you girls have created using these jumping for joy animals! 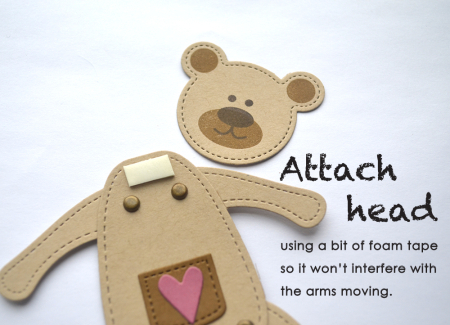 How cute would they be cut from wood … with the die cuts, I’m sure some genius with a jigsaw could do it!!! Always looking for ideas for kids cards. Can wait to get Jumping for Joy! So cute! Our adult sons reached out to friends and coworkers of both me and husband for a “big” birthday and asked them to send a card and share something special about us. They surprised us with a great collection of handwritten notes and cards. It was such a thoughtful thing to do. Wonderful release. I think your question for when I really felt loved was for today. When I was 13 I cried every day after school. And every day my mother came to my room and listened and hugged me until finally one day that school year was over. That is true love.